You might say that Lenesia Cooper is in the transportation business, but she is also in the event planning business. What exactly does she do? She has a family-owned business in Atlanta, Georgia that uses buses to bring the party to her customers. 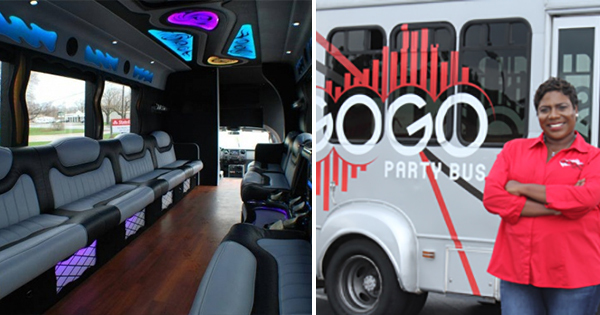 It's called GoGo Party Bus, and in many ways, it's a much better alternative to renting a limousine. Her company owns 6 party buses fully equipped with televisions, strobe lights, music, and karaoke machines -- everything to make a fun party. The buses also have plush seating, hard wood floors, an audio/video media center, and wet bar. Each bus accommodates anywhere from 14-30 people, and her clients include people celebrating engagements, weddings, bachelor and bachelorette parties, graduations, as well as company functions. Lenesia started her business 5 years ago, and experienced almost instant success because her business skyrocketed within the first two years after launching. It was because she had found a niche for offering customers something different - a mobile stress-free service that allows people to have fun while on the go. Business has been so profitable for Lenesia that she is now allowing other entrepreneurs to franchise the concept. The startup costs for interested entrepreneurs is relatively low (around $15K-25K), and the model is already proven to work. She told Black Enterprise that she created the franchising option because she felt the idea "could be replicated easily with other individuals, who are serious about being an entrepreneur or who are looking for some residual income." Her ultimate goal is to make GoGo Party Bus the No. 1 preferred form of transportation for celebrities and professionals in Atlanta.